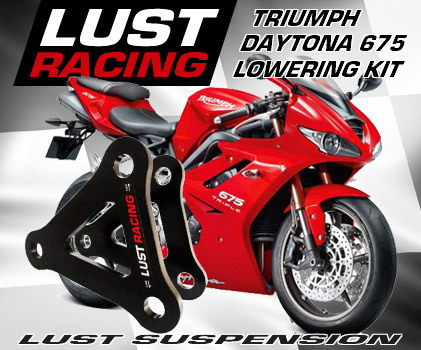 We offer 1"inch (25mm) and 1-5/8" inch lowering (35mm) lowering kits for the rear suspension for Triumph Daytona 675 models 2006-2012 and 2013 to 2015 models.. Our kits are delivered complete with model specific installation instruction. After installing the rear suspension lowering kit on your Triumph Daytona 675 you may also lower the front end, no additional parts needed. Instructions for lowering the front forks in the installation instruction.